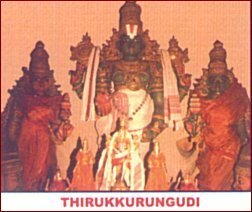 Thirukkurungudi temple can be reached via Tirunelveli - Naanguneri - Kalakkaadu. The Moolavar is Nindra Nambi (Kurungudi nambi, Irundha Nambi, Varuga Nambi, Vaishnava Nambi, Tirupaarkadal Nambi, Malaimel Nambi) seen in standing posture facing east. In between the Nindra Nambi and Kidandha Nambi sannadhi there are sannadhis for Lord Siva and Bairavar. The Irundha nambi Perumal is known by the naamam Vaigundha Naathan.There is a sannadhi for Sri Manavaala Maamuni. About 3 furlong from Tirupaarkadal kulam, there is a sannadhi for Tirupaarkadal Nambi. On a hill about 6 1/2 miles, there is a sanndahi for Malaimel Nambi. Kaisika Natakam is performed every year on Kaisiaka Ekaadasi. The story of Nambaaduvan, a devotee who was asked by a rakshasan to give him the fruits of his punyam is enacted. This kurungudi sthalam is also called as “Vaamana kshetram”, who is one of the avatharam of Sriman Narayanan, born in Puratasi month – Sukla patsham in Sravana Thuvadasi for Kaasyabha Maharishi and Athithi. The dhavadasi in which he was born is Vijaya dhavadasi. He was teached the Savithri mantram by Suryan and Vyazha Guru Bragaspathi taught him the Brahma Soothiram. Since , Vaamanar was born to the Maharishi, his clothes and all the activities was same as how a rishi should be. He got the Dharbai from his father – Kaashyaba Maharishi Bhoomi (or) earth gave krishna Aasanam, Chandran gave him the Thandi, (Which is used as a support for the hand), Athithi gave Koupeenam (Clothes)Brahma devan gave the Kamandalam, some vessels given by Guberan and Bharadhwaja Maharishi was his Guru and teached him all the vedas. Parasakthi gave him food with her thirukkaram (hand) when he begged for food. Inspite of taking the thirivikraman – ulagalandha perumal Kolam, Vaamanar is giving his seva as a short muni in this sthalam. Because of this, this sthalam is called as “Kurungudi”. By this sthala perumal’s Kurungudi Nambis seva only, Nammalvar born to his mother, Udaya Nangai. Thirumangai alwar got his Mukthi (attained paramapadham) in this sthalam and as a memory of this, a small temple is constructed with the name “Thirumangai Alwar Thiru varasu” in the banks of the river, which is towards the east direction of the temple. “Nambu” means believe and “Nambi” means believed by all. As the name of the perumal, Nindra Nambi, he is believed and devoted by all the bhaktaas. Like Narayanan who gives his seva in Nindra, Kidantha and Irundha thirukkolam, Siva perumaan also gives his seva as Siva linga Swaroopan in Nindra Kolam as a dancing person. Thirukkayilai and as Thiruthaandava Kolam as a dancing person. Like the same way, Siva perumaan when came to meet and get the dharshan of Nambi perumal, he met him and got the Vimochan of the pabham. As a result of this, a separate sannadhi for Lord Shivan as “Magendranadhar”, who is found inbetween Kidantha Nambi and Iruntha Nambi perumal sannadhi. Nearer to Kurungudi, there lived a valla Baanan (musician) who wanted to worship Kurungudi Nambi on sukla patch Ekadesi. Once, he came along the way to Kurungudi, a Brahma Raatshashan (a wild demon) was very hungry and happened to see this Baanan. It said him that since he is too much of hunger, he is going to be ate as his food. But Baanan replied him that he is going to Kurungudi to get the dharshan, of Kurungudi Nambi and after getting that, he can eat him. After getting the words from him, the demon asked him to go and will wait until he comes. The Baanan after reaching Kurungudi, stood infront of the Kurungudi temple vaasal (entrance) Inspite of the Dhavasthambham (Kodi Maram) screened the perumal without seeing it, the Baanan started to sing on him, forgetting all things around him. After hearing this, the Kodimaram, which was infront of him made a way to the Baanan, so that he could see the Nambi perumal. He sang the Paasurams of Nammalwar with some musical way in it. After getting satisfied on the Baanan’s devotion and his devotional songs, Kurungudi Nambi gave his seva to him and gave him the title as “Nampaaduvaan”. Nampaaduvaan can be explained as that the song was sung about the perumal and Baanan was singing it and from now he should sing always on him. And to extend this, he was gave the title as “Nampaaduvaan” by the perumal itself. After getting the dharshan and getting the title from Kurungudi Nambi, the Baanan went straight to the Raatshashan and asked him that now he can eat him as his food. The demon asked what did he sing on the perumal? As the Baanan started to expalin it, the demon hearing it gorgot all of its hunger and let the Baanan free. Inspite of being so wild, the paasurams of perumal went along the Ears of the demon and filled not only the stomach of it but also the entrie heart and body of the Raatshashan. And the perumal asked Baanan to give the Paasuram to the Raatshashan so that he will not suffer from hunger anymore and he gave him the paasuram. This story is well explained in Varaha Puranam. This story is played as a small drama during Kausika Ekadesi. The prasaadham (food) which is done the Naivedhyam (offered) for the perumal is offered for Lord shiva of this temple. On entering the temple, a big Mattaiyadi Mandapam is found and we can also see another Mandapam, Nadhi Mandapam. After crossing, the kodi maram is found, with lots of rare sculptures in it. Next to the mandapam, we find the sannadhi of Manavala Maamunigal. An hanging bell can be found in Kulasekara Mandapam which is offered by a king of Thiruvidhangodu to the Nambi perumal. Moolavar Nindra Nambi is also named as “Pari pooranan” and found along with two pirattiyaars, Maarkandeya Maharishi and Brighu Maharishi in Nindra kola seva. Next to him, we can find the Vainava Nambi, the utsavar along with two pirattis, Neela Devi and Kurungudi valli thaayar. On the south pragharam of this temple, a separate sannadhi for Lakshmi Narasimhar, Lakshmi Sametha varaha Moorthy and in west prakaram - all ten Avataars, Dasavathaar, Srinivasa perumal Andal and Kurungudi Valli Thaayar Sannadhi are found. Also separate sannadhi for Nindra Nambi, Veetrirundha Nambi, Kidantha Nambi. Close to the Nambi's legs, the head of the Mahabali is found. The Irundha Nambi is also named as "Vaikundhanadhan". 5 Kms after this sthalam, Malaimel Nambi is found on the top of the mountain. Kurungudiyavan kudi is the other name for Vaamanar of this sthalam and he is found on a small Chattiram, 1/2 miles on south direction. 1/2 miles away a small river named "Thiruppaarkadal" is found, where Thriuppaarkadal Nambi Sannadhi is found. Theerthams - Tirupaarkadal, Panchaturai, Sindu river. Nammalwar - 2782, 2986, 3161-3171. Thirukkurungudi, this beautiful pandiya nattu Divya Desam is located about 27 miles from Tirunelveli, and about 8 miles from Swayamvyakta Kshetram, Vaanamaamalai. 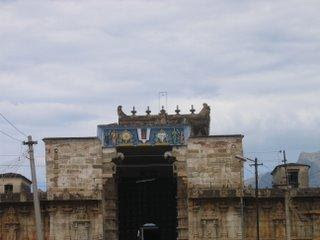 This sthalam is situated in Tirunelveli district in Tamil Nadu. Known as the ‘South Badri’, Azhagiya Nambi temple at Thirukkurungkudi is about 15 kms from Nanguneri. One can also take a bus from Naanguneri (Cheeri varamangai). Frequent buses from Valliyoor. There is no lodging facility. Take a train from Bangalore to Tirunelveli! Nagercoil express runs 4 days in a week which connects Bangalore with Tirunelveli. You can directly take a bus from Bangalore to Tirunelveli as well. State Government buses are operated between Bangalore and Tirunelveli as well. It takes around 15 hours in bus to reach Tirunelveli from Bangalore.